Can Gaining Muscle Make You Gain Weight? When you start working out, you typically expect to lose weight, not gain it. But don't worry if you're not dropping pounds on the scale -- chances are, your workout routine is making you gain lean mass, not fat. If you're trying to lose weight, you'll still see positive changes in your body even if you're gaining instead. And if you're trying to gain, putting on muscle means you're on the right track. No matter what your goals, be sure to talk to your doctor to discuss your diet and exercise before you make changes. Enlisting the help of an online calorie calculator to track your daily nutrition is also a great resource. Gaining muscle may add numbers to your scale, but it has more benefits than drawbacks. Muscle burns more calories than fat, which makes it easier for you maintain a healthy weight. This is especially important when you're trying to lose weight, because it means you may not need to restrict your intake as much to continue to drop unwanted pounds. Muscle is also good for your health. Strength training improves blood sugar, bone health, mood, sleep and heart health. It also improves overall strength, balance and quality of life. If you're trying to gain, you'll be healthier if most of the extra weight comes from muscle. But you have to work for it. Without the right exercise, every 2 out of those 3 pounds you add might be fat, according to IDEA Health and Fitness Association. For muscle gain, strength-training is a must. Work out all your major muscle groups -- arms, legs, back, shoulders and abs -- two to three days a week. Complete a minimum of one exercise consisting of three to 15 reps, where the last rep is so hard it's nearly impossible to do. Muscle gains should go slow -- at a rate of 1/2 to 1 pound a week, according to IDEA. While you may gain a lot at the beginning, you might settle in at a rate of less than 1/2 pound a week after a year. How and what you eat is as important as your workout when you want to add muscle weight. Muscle growth requires extra calories. Up your calorie intake by 200 to 400 calories a day to help you gain. You also want to focus on getting enough protein when muscle building. For muscle growth, aim for 0.7 to 0.8 grams of protein per pound of body weight, or 126 to 144 grams for a 180-pound person. There's protein in a wide variety of foods, so you shouldn't have much trouble meeting your daily needs. One egg has 6 grams, 3 ounces of chicken 26 grams, 1 cup of low-fat yogurt 12 grams, 1 cup of quinoa 8 grams and 2 tablespoons of peanut butter 8 grams. Meal timing is also important for muscle weight gain. Be sure to eat a meal or snack with carbs and protein one to three hours before your workout -- try a turkey sandwich or Greek yogurt and fruit. Carbs provide energy, while the amino acids in the protein jump-start the muscle building before your workout. The post-workout meal is equally important. The half hour following exercise is prime time for muscle recovery and building, making it the ideal time for another carb and protein snack such as a glass of low-fat chocolate milk or an apple with peanut butter. Hearing that muscle weighs more than fat may make you feel better if you're noticing that your weight is going up instead of down when you're working out. However, while this myth has been circling the gym for quite some time, it's not true. One pound of fat weighs the same as 1 pound of muscle. The difference between fat and muscle? Density. A pound of muscle takes up less space than a pound of fat. If you're working out to tone up, you might want to consider paying more attention to how your clothes fit than the number on the scale, especially in the beginning before you're body's had a chance to burn off some of those fat pounds. Water retention may be one of the reasons the number on the scale is going up instead of down when you're building muscle. Lifting weights strains and tears your muscles, creating an injury. The muscle soreness you feel a day or two after a strength-training day is part of the healing process. In addition to the "feel good" pain, your muscles may also swell with fluid. Those extra pounds may just be water trapped in your sore muscles, and it may hang around for up to 10 days. If you're working out to lose weight, you might find the soreness and the added pounds discouraging. But the only way to get over the pain, and lose the weight, is to continue to work those muscles. Exercise is important for weight loss, but so is diet. If you haven't made an effort to change your diet when exercising, you may end up compensating for the calories lost during your workout by eating more, according to a 2012 review study published in Obesity Review. If you eat more than your body burns, you'll gain weight. Exercise may suppress appetite, but weightlifting to build muscle may not keep hunger away as well as a 30-minute run on the treadmill. Plus, those extra calories you burn with the added muscle may stimulate your appetite. If you don't want to add pounds when adding muscle, you need to pay more attention to your diet, specifically your calorie intake. Maintaining calorie balance can help you maintain weight, while eating fewer calories than your body needs helps you lose. Determine the number of calories you need to maintain your current weight with an online calorie calculator, and aim to meet that number daily. If you're trying to lose weight, eating 500 fewer calories a day from what you need to maintain can help you lose 1 pound a week. Tame your hunger with low-calorie nutrient-rich foods, such as fruits and veggies, whole grains, lean sources of protein such as poultry and beans, low-fat dairy, and healthy fats such as olive oil and avocados. Add aerobic exercise such as a brisk walk, bike ride or an aerobics class to burn calories and suppress appetite. In a perfect world, you'd be able to work out anytime you like. Unfortunately, work, school and family may get in the way, which means you're working out to build muscle in the very early morning hours or late at night, disrupting your sleep schedule. Not getting enough sleep affects hormones that regulate appetite, and may make you hungry for foods high in carbs and sugar, which may lead to overeating and weight gain. If you're a morning exerciser, skip the nighttime TV and go to bed earlier so you're well-rested for your early workout. Night-time exercisers should aim to finish their workout three hours before they hit the hay to allow the body time to relax for bed. Columbia Health: Sleep or Exercise? 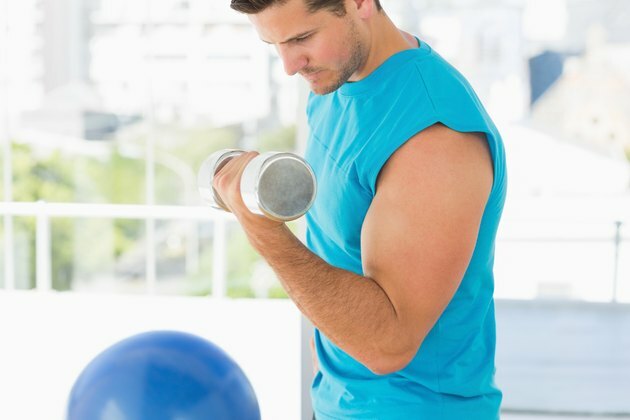 Does Muscle Mass Increase Your Weight?